If this Halloween you have dreams to dress up like a member of the military and tote your own selection of guns and hand grenades, there might be a great way to get the experience if you're too old for trick-or-treating, you'll just have to travel to Beirut. 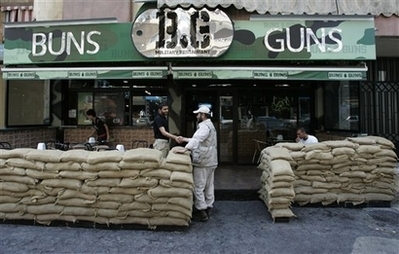 In Lebanon, in an area that is relatively free from political warfare, the Buns and Guns Restaurant has opened. 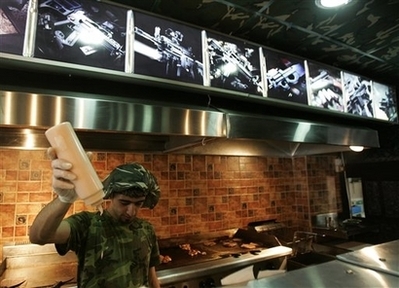 The sandwich shop, which has the motto "one sandwich can kill you" because of the enormity of its meals has a military theme sure to make military fanatics feel like they're dining in a warzone without any actual gunfire or fear of death. The staff is dressed in military fatigues, while the menu features a similar themed design as do the names of the meals; but what really makes the experience, is the recorded track of gunfire, low-flying airplanes and hand grenades. Plus, the outside makes you feel like you're about to enter a bunker, sandbags and all! Ironically enough, Buns and Guns has said that the legitimate military presence in the country has also lent a positive aspect to their marketing plan. Go figure!